A three-dimensional rendering of Lake Cheko in Tunguska, Siberia. The level of the lake is lowered 40 meters (131 feet) to emphasize its cone-like shape. Should the team turn up conclusive evidence of an asteroid or comet on a later expedition,when they obtain a deeper core sample beneath the lake, remaining mysteries surrounding the Tunguska event may be solved. The findings are detailed in this month?s online version of the journal Terra Nova. "Expeditions in the 1960s concluded the lake was not an impact crater, but their technologies were limited," Longo said. With the advent of better sonar andcomputer technologies, he explained, the lake took shape. "To really find out if this is an impact crater," Longo said, "we need a core sample 10 meters (33 feet) into the bottom" in order to investigate a spot where the team detected a "reflecting" anomaly with their seismic instruments. They think this could be where the ground was compacted by an impact or where part of the meteorite itself lies: The object, if found, could be more than 30 feet in diameter and weigh almost 1,700 tons — the weight of about 42 fully-loaded semi-trailers. 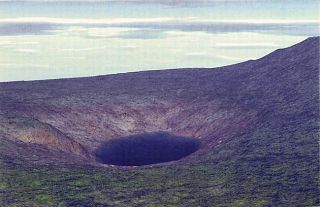 Harris agreed that physics could work against Longo's explanation, but did note that similar events — with impact craters — have been documented all over the world.